When Hurricane Sandy hit in 2012, the large majority of homes in Red Hook, Brooklyn were flooded, losing heat and electricity for 30 days or more. The Red Hook Initiative (RHI), a youth development center in the neighborhood, found itself playing a crucial role in recovery efforts. Some of RHI’s recovery work was what you would typically associate with disaster recovery. But one of its more untraditional projects proved to be more valuable in this time of need than even RHI’s staff had ever imagined. Red Hook Wi-Fi is a program of the Red Hook Initiative. The Red Hook Initiative offers educational support, job training and leadership opportunities to youth and young adult residents of the Red Hook Houses, a low-income housing development in Brooklyn, the second largest development in the New York City Housing Authority’s portfolio. 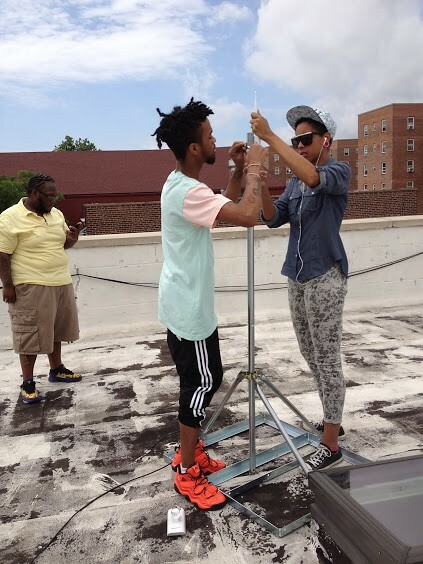 Our Wi-Fi network was initially developed as an effort to share the work and resources of the Red Hook Initiative beyond our physical walls (through the splash page users see when accessing the network), and to provide broadband access in a community where in 2010, only 40-60% of public housing apartments had access to broadband. The resiliency aspect of the Wi-Fi network only became apparent to us in the aftermath of Hurricane Sandy. While large corporate Wi-Fi and cellular networks were down for days after Sandy, our network remained online (we were lucky that our routers were installed on buildings that did not lose power) serving as the main communication channel for public housing residents. At that time we had two outdoor routers- one providing Internet access in the area around our building, and another hotspot covering a central park in the neighborhood, not connected to the internet. We were using the park node to experiment with an intranet, a network that users could use to communicate and get information within that specific hotspot. During Sandy our community center became the hub of recovery work for public housing residents, and our Wi-Fi network was used by 1000 users daily. Other recovery work, including the Red Cross, Mayor’s office and National Guard was happening in the nearby park. With RHI staff and volunteers from RHI, FEMA, Brooklyn Fiber and the Open Technology Institute, we added bandwidth and connected the two hotspots, to provide both areas with stable access to the internet. Since then, we have grown our network to 15 hotspots and are training and employing local residents to install, maintain and promote the network, in addition to finding work in tech and other industries. In 2016, through grants and partnerships with the City of New York, local ISP’s and a private Wi-Fi network installation company, we will expand to over 50 hotspots on commercial streets of Red Hook, and provide outdoor and apartment access for more public housing residents. When we started this project pre-Sandy, resilience was not a word that was being used in New York often. We were cognizant of the importance of locally maintained and governed infrastructure, but more as an antidote to the lack of consumer control of corporate services, especially for those in marginalized communities like our own. Climate change resiliency efforts, being all the buzz in New York now, have allowed us to gain resources to continue expanding the network and building in preparedness measures, including solar panel backups for our gateway nodes to the internet. But what makes our network special, and will ultimately contribute to its success in times of crisis, is that local residents are both the users and administrators of the network. Community leadership is a central tenet of our work, (“Change from Within” is the tagline of RHI, 90% of our staff live in Red Hook), and it is integrated into the daily functioning of our network. A community is truly resilient when its people possess employable skills, economic independence and strong social networks. The local Wi-Fi network and its backup systems will function as a basic resiliency measure when other systems are down. But resiliency in its essence comes from the local young adults who service this network. Our technology career-training program, the Red Hook Digital Stewards, helps these youth acquire skills and good jobs, and supports their desire to help their neighbors. Resiliency comes from strong social networks, which are being developed through the building of our virtual network. 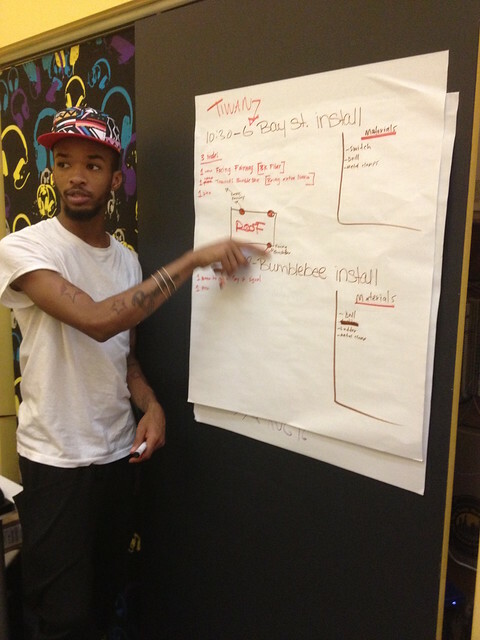 Our program participants, young adults from the NYCHA Red Hook Houses, are working in neighborhood homes and businesses, installing routers, creating marketing materials, and volunteering their skills at neighborhood events. These connections have led to jobs and relationships across cultural boundaries. To me, this is the ultimate success of the Wi-Fi work, and what will lead to success and resilience for all residents of Red Hook. Post by Tony Schloss. Photos by The Red Hook Initiative. Tony Schloss is the Director of Technology at the Red Hook Initiative, a member of the NYC Mayor’s Broadband Task Force, and proud resident of Red Hook, Brooklyn. Follow #citychat on Twitter from 3 p.m. to 4 p.m. EST on Thursday April 28th to learn more about the role of social and community capital in climate adaptation efforts. Even if you don’t have a Twitter account, you can watch the conversation unfold here.